The information online is 30 years outdated. It is genetic. Neither Robert nor I have any family history. 1 out of 125 people carry the mutated gene. 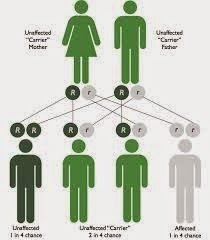 Both parents must have the gene in order for their offspring to be an affected carrier. There is a 25% chance their offspring will be an affected carrier (like William). 50% chance their offspring will be a non affected carrier (like Robert and myself). 25% chance for their offspring to be a non carrier. There are over 100 different types of mutations for the same gene. There is an adult onset Krabbe Disease. There are two states that I know of that now test for Krabbe Disease as part of their newborn screening: New York and Pennsylvania. Remember, it can be cured if treated before symptoms begin. Krabbe disease can only be confirmed through a blood test after birth, not through amniotic fluid before birth. 1 out of 100,000 babies world wide are diagnosed with Krabbe each year. I am 100% confident I will never win the lottery.